With the inevitable challenge of Universal Credit, housing associations must find new and more reliable ways to protect their rental income. A “good” website is often cited as one way of doing this – but what makes a housing association website truly effective in helping protect rental income? Around 46% of social renters already have access to a smartphone. It’s charity giving for the Uber generation. There comes a moment when it’s just you and a cursor on a screen. There it is, flashing away expectently in the top left corner of a large white field of text. The moment you start typing, the doubt fills your mind and works its way down to your fingers. Every word, every sentence just seems empty. Pointless. Self-indulgent. False. Not positive enough. Pompous. And you begin to wonder – can you even write any more? I don’t know what writer’s block is. I write every day, short pieces, longer pieces. But can I really write? What is all this copy that’s just streaming out? What does it mean? Who will read it? Who will care? And will it survive once I’m gone? Everyone is a writer these days. There are blogs-a-billion, eclipsed only by the number of views on pewdiepie’s YouTube account. The hope of making some kind of impact on the world through writing feels futile… arrogant, even. So why bother? I’m almost up to 160 words now, the count at the foot of my screen relentless increasing whilst the meaning of this prose diminishes further and further. Distractions abound. Look, there’s an email. Ooh, the Twitter icon has turned blue. My phone buzzes with a missive from my… well, now here’s the part where I start self-censoring more actively. To write is to live. And if I can’t write, can I even live? Spock kicks in. Of course, don’t be so ridiculous. You can write. You just did. And you can share it with whomever will read and it really doesn’t matter what they think as long as you think it is worthy. Stream over. Press publish. Go home. Write again tomorrow. I spent a few days earlier this month at my first ‘pure’ training conference for a while. Thinking Digital “brings together people curious about how technology is shaping our future”. That means it’s a day of great talks by interesting people about tech, arts and the future. Having run successfully for eight years in Gateshead, the organisers decided to hold an offshoot event in Manchester and I went along for the first time on Tuesday. the concept of digital “dieting” to focus on better communication and thinking. How to Talk – a fascinating guide to effective public speaking. what ‘Tech North’ is really all about during a slightly heated panel discussion. There are many videos from previous talks already available. The previous day, I took part in an afternoon workshop about vlogging — producing short video, primarily on mobile. According to the workshop trainer, the human brain processes visual information 60,000 times faster than text! Clearly, useful & engaging visual content is something that could be massively useful to our community & I’d like to find ways of using it effectively. As proof of what I learned, I produced the video at the start of this post from the main conference day which took “only” 2-3 hours of editing on unfamiliar software. Hopefully that will become a lot quicker as I develop ability – and style! Unsurprisingly, I also met all sorts of interesting people at Thinking Digital — from technologists, to creative makers and those who were simply curious about the future. Do go along to Thinking Digital the next time it’s near you — even if it doesn’t seem directly relevant to your work, it’ll be an inspiring day with plenty to take away and consider in your day to day life. After a few years of use, the non-stick surface began to degrade severely. Against the manufacturer’s preference, I’d been using it in the dishwasher and I’d lost the receipt, so I was unconvinced that Circulon would honour their guarantee. Nonetheless, I sent their (quiet) Twitter account a disappointed tweet. I received a reply the next morning: after a short conversation, their Twitter team quickly arranged for their customer service to be in touch with me to take more details by email. Within three weeks, I received a completely new set of pans! Apart from the cookware itself, this was my first interaction with Circulon’s manufacturer and it was the start of a great customer experience. I was disappointed when I sent Circulon my tweet. I didn’t consider who would be responding to my tweet, if anyone. To their credit, the person behind the Twitter account kept the response polite and showed empathy with my dissatisfaction. They clearly understood I was disappointed and wanted to restore my confidence in their product. We often receive enquiries or support requests through Twitter, which falls outside our usual defined way of receiving requests. As a customer, I’ll always pick the method of contact that’s most convenient for me – firing off a tweet for something that isn’t worth a call or an email. Circulon made sure that when I was emailed by customer services they were already informed about my experience to date and simply required details that I couldn’t share over Twitter. The most important part of the story was that Circulon kept their promise. They honoured the lifetime guarantee of the pans and I wasn’t required to show proof of purchase nor return the original set. During product development, the manufacturer clearly put thought into how they’d fulfil the promise of a lifetime guarantee. This is something that we pride ourselves on too. We do it by making sure we promise the right thing to our customers when they ask us to help. Sometimes that also means saying no: we can’t always offer what a customer needs at the price point they require, especially as we only quote from list prices. We do confidently stand behind what we provide to customers and our support team are independently empowered to solve things confidently – we try to avoid bouncing up a chain of command where possible. When I bought a set of fancy Circulon pans with a lifetime guarantee of replacement, I also bought the promise of new pans if things went wrong with the old set. Circulon fulfilled that promise and delivered a great customer experience at the same time. They know their brand is reliant as much on the style as the delivery: when things go wrong, it’s how well you respond that keeps customers happy and even encourages referrals. I’m happy to continue recommending them and I’ve even learned some lessons along the way! What brands have delighted you when you’ve encountered a problem? Let me know in the comments! 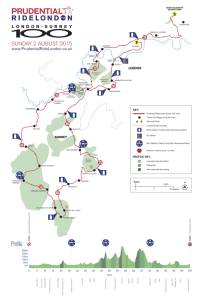 RideLondon 2015 – ride report and thank you. I arrived at the Olympic Park early on a Sunday morning in August and realised there was no going back. All of that effort led up to this day. Thank you for your support. Together, we’ve raised £633.51 for the Albert Kennedy Trust – helping end LGBT youth homelessness! A couple of weeks ago, rainbow flags enveloped social media. It was a reminder of how much attitudes towards equality have changed in a dramatically short period of time. Legal equality is now a lot closer than it was as little as ten years ago. Social equality is another thing. Laws can be passed. Role models can get paraded in glossy magazines. We can start talking about celebrations, not protest marches. Attitudes can still be ugly. And young people can still feel alone, can still be living terrified in hostile conditions, just for being who they are. When they feel that way, the choices can often seem bleak. Sometimes, they might feel they don’t have a choice and they can’t just… keep going. No-one should feel that way. We’re hitting the season of summer celebrations across the country and the world. It’s going to be a big one, given the news from the US. But I’m not quite in the spirit of things yet. A couple of months ago, I declared myself “in training” for what will be my biggest cycling challenge to date. On 2 August, I’m joining 20,000 other riders to cycle 100 miles between London and Surrey in the RideLondon 100 event. 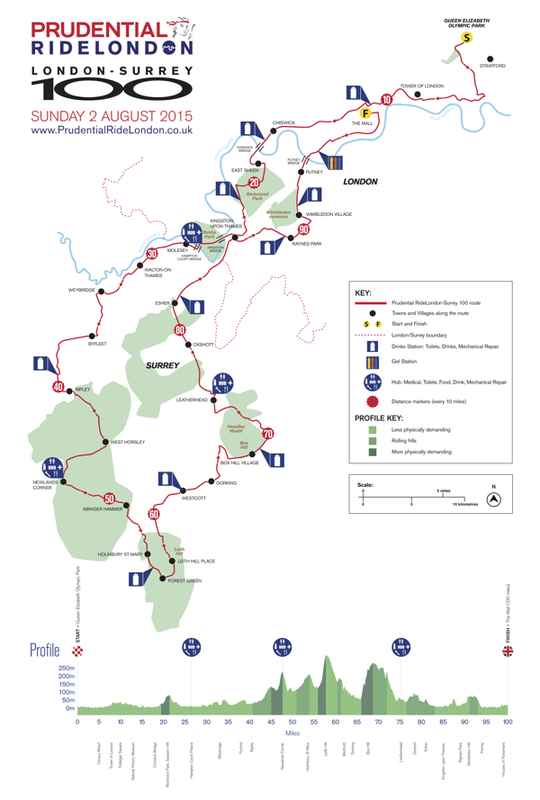 The annual closed road ride follows a similar route to the London 2012 Olympic Cycling road race, including the infamous Box Hill in Surrey. Setting off from the Olympic Park in Stratford, through central London to Hampton Court and out to Surrey for the most gruelling part of the ride. I’m hoping that the thought of a triumphant return and sprint finish down the Mall will keep me spinning slowly up the hills. Given my generally poor fitness levels, I expect it to be struggle. Just to complete the full ride (and not get shuffled off roads that are about to re-open) I need to maintain a minimum ~13 mph average. For over 8 hours. Think of it like the London Marathon but for cyclists. It’s now the last few weeks of training before the ride. And the biggest challenge to achieving this is the fight against myself. For a long time, I didn’t think I was the kind of person who could train for a physical achievement. Over the last 8 weeks, I’ve slowly begun to change that belief. I’ve been following a cycle training plan that’s seen make wake up as early as 7am (!) or ride after work to ride 20-30 miles three times a week in whatever weather. At the weekends, I’ve been riding increasingly long single rides in order to build the stamina I’ll need to make it through the full 100 miles in August. Last weekend, I rode my longest ever single ride: 70 miles. Finally, I believe that I can keep going and do the full 100 mile distance. Now, I’d love it if you’d help inspire other young people facing much more extreme crises to keep going too, by sponsoring me. I’m supporting the mission of the Albert Kennedy Trust to end LGBT youth homelessness and help other young people believe that they too can keep going, even when they live in hostile environments. The Albert Kennedy Trust is named for a lad who ran away from a Salford children’s home. In 1989, he fell to his death from at the roof of the Chorlton Street car park. His death moved Cath Hall, a local foster carer who knew Albert to found the trust in his memory. She was angry about the apparent epidemic of young LGBT people facing difficulty and crisis in foster care, of which Albert was a tragic victim. Today, the Albert Kennedy Trust (AKT) provides essential support for young LGBT people between 16-25 who are made homeless, or are living in hostile environments. Still operating in Manchester, they’ve expanded to London and Newcastle — providing financial support, legal advice and the new Purple Door project of safe places to stay for homeless young LGBT people. Even though they now count Ian McKellen and Julie Hesmondhalgh amongst their patrons, they’re not a widely-known charity brand. It’s been awesome to see the positive impact of their work and that’s why I’ve supported them personally for a couple of years now. But in some ways, the crisis still goes on — perhaps more hidden now and certainly far less mainstream. AKT know that there are always more young people they could help support. More young people who need help to achieve their full potential and just… keep going, even when everything seems against them. That’s why I’d love it if you’d consider supporting AKT’s mission to end LGBT youth homelessness by sponsoring me to ride 100 miles this August. You can sponsor me right now here. It’s quick and simple so do it straight away. Oh and, if you fancy supporting me on the early August bank holiday weekend, do come down to London. There’s a whole weekend of closed roads and cycling fun. And on the 2nd, you can sit in the pub, watching the TV coverage before lining up my pint after my final sprint^W struggle the down the Mall! Thanks for reading and thanks for your awesome support to help end LGBT youth homelessness. Since a European Court of Justice ruling last year, individuals have the right to request that search engines remove certain web pages from their search results. Those pages usually contain personal information about individuals. I’ve decided to do something similar. This weekend marks the inaugural Cycle Hack Manchester: part of a global movement to find ways to remove barriers that stop or inhibit people from cycling. It sounds like an exciting and wonderfully positive event and even more so by being part of a global movement. Unfortunately, I can’t be there. But I look forward to reading about what happens. Because I believe that cycling can be the biggest hack for this city’s greatest problem: congestion. Cycling around Manchester is both a joyous and intensely challenging experience. Manchester is one of the most congested cities in Europe. It’s incredible to believe though when you consider the city centre has one of the lowest levels of car ownerships in the country. In 2010, before the endless development work and at the height of the recession, the average speed of traffic in central Manchester between 1700-1800 was barely 12 mph. Cycling in Manchester does put you right in the middle of that slow, congested mess – but it offers a way out. It’s by far the quickest way to get around, certainly for journeys up to 5 miles. It’s door-to-door and with a reasonable speed of 12 mph is no slower than the average speed of cars in traffic. The council leader even demonstrated this in a race between bikes, buses, cars and trams. Getting more people moving is key to making Manchester the Northern Powerhouse it seeks to become. How can the city seek to deliver economic growth when you can’t even get to the office or to shops? That’s why cycling could be one of the simplest, cheapest and most effective hacks to relieve this city’s chronically congested arteries. This is the narrative that I’d like to see explored further when it comes to promoting cycling. It’s not about endless training courses, or bits of plastic on your head. Cycling can help solve congestion. It can get more people moving, quicker. No-one can claim that this is a bad thing. Yet politically, there’s much against people who use bikes to get around. The (cycling!) council leader seems to hate cyclists. The police stop cyclists for minor misdemeanors whilst blocking bike paths and advanced stop lines. New developments ignore cycling provision or even dig them up. Metrolink, in particular, ignore the pleas of cyclists not to destroy key commuting routes. All while the council PR machine bleat on about training and helmets as the answer to getting more people on the road. I won’t even start about other road users who regularly terrorise vulnerable people on two wheels. So – deep breath – what do we do? Tweeting angrily to councillors is pointless. Making them sign petitions is worth little, particularly when there’s no opposition to hold councillors to account on their promises. It seems to me that the only thing that has really seemed to make an impact in the short to medium term is harnessing the power of the business community. The Cycling Works campaign in London showed that if you can get businesses & employers behind your campaign, using a narrative of reducing congestion, economic growth (and safety), you can make change. London is seeing the development of the biggest, most substantial and highest-quality cycling infrastructure it has probably ever seen – the East-West Cycleway. It’s not perfect, but this type of fully thought-out, segregated and connected infrastructure will get even more people moving about by bike and hopefully lead to a snowball effect in the nation’s capital. Contrast this to a councillor’s statement at a University of Manchester salon on cycling, that the inability for cars to get around the city centre due to the works would in fact lead to more people using bikes! Manchester holds dear the platitudes of bygone heroes about progress and love. Progress as a Northern Powerhouse is impossible without solving problems held over from the past. Let’s work together with business and employers across the city to build a new campaign and show the same leadership and forward-thinking for which Manchester has historically been known. Because cycling could be the biggest hack for this congested city’s economic growth. I recently migrated yet another WordPress site from a Turnkey Linux install to join my others on Bytemark Symbiosis. As I’ve briefly mentioned elsewhere, this went without major problems. I also decided to configure SPF and DKIM as part of my plan to finish migrating mail services over. However, I didn’t consider the fact that this has an impact on the deliverability of emails sent from WordPress and presumably other similar PHP-based web applications. Your email failed one or more of the following industry-wide authentication checks that Yahoo uses to verify emails are truly sent from the domains they claim to originate from. It goes on to briefly explain DKIM, SPF and DMARC (not currently implemented in Symbiosis). Thankfully, this is a solvable problem – in fact, it’s not even really a problem, as Yahoo! Mail is just doing its job by checking for correct DKIM headers. Edit your theme’s functions.php to include an extra code snippet that configures WordPress to use SMTP to send email. Use an extra plugin to bring this functionality to all themes and WordPress email functions. Chad recommends WP Mail SMTP which I’ve just deployed and tested briefly with WordPress 4.0.1 (this may useful for multi-site setups too). You need to create a mailbox first, if that isn’t obvious, e.g. blog. The SMTP host is mail.my-brilliant-site.com (on default port 25). The username must follow the example blog@my-brilliant-site.com. Obvious, perhaps, but I always forget this. I used TLS encryption successfully. If you’ve tweaked your Symbiosis install to be non-standard, then you’ll have to reflect that here but otherwise it’s pretty much the same as setting up a mail client to send mail. If you’re using the WP Mail SMTP plugin, then you can send a test email. I recommend trying to send it to a Gmail or Yahoo! Mail address. The result you’re looking for is bool(true) – in addition to the test email of course, which you can examine to ensure it includes the right DKIM-Signature header. I hope this helps with any head-scratching you might have also been doing!